Brian Wood is the author of Dreamworld, Book 1 in the Chronicles of Trayvian James. Book 2, Reality, releases spring 2012. 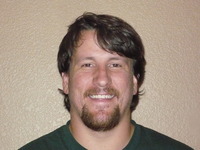 Brian is a high school math teacher and basketball coach in the South Denver Metro area. He likes to hang out with his daughter Carly and wife Chrystal. He takes inspiration as a writer from people like J.K. Rowling, Robert Jordan, Jim Butcher, Brandon Sanderson, and many others. We’d love your help. Let us know what’s wrong with this preview of The Son of Neptune by Rick Riordan. We’d love your help. Let us know what’s wrong with this preview of Beach Music by Pat Conroy.